The Tex Files - Home of Arianne 'Tex' Thompson: Slush, Bang, Boom! This is me, not writing a blog post. This is me, not writing a blog post, because I have a million other things to do. This is me, not writing a blog post, because I completely 100% do not have an hour to spend meticulously word-crafting a digital Fabergé egg. Dammit, I just stopped to look up where the accent goes in 'Fabergé'. I guess I'm committed now. Write Club kicks off today, and my rakish colleague Dan Koboldt and I could not be more excited! How excited, you ask? So excited that we did a postmortem slush-report together! Think of us as your friendly local Macy's Day Parade reporters, if the giant Pikachu balloon and the Hamburger Helper float were going to duke it out right there in the middle of Fifth Avenue... cuz that's exactly what's happening! Anyway, do get your seat and popcorn ready for the contest - and if you're a writer who wants to know what makes a submission stand out, check out the trend breakdown of our epic 85,000-word slush-fight. Oh lord, that took way too long. I actually Googled the Macy's Day parade float entries. Faster, friends, faster! I went to the RT Booklover's Convention this weekend! (In much the same manner as pigeons go to the zoo: neither a paying guest nor a featured attraction, but present nonetheless.) And oh my cheese, y'all. What a place. What a time! Y'know, in my sci-fi/fantasy circles, romance doesn't get much respect. Well, I tell you what: you can gawp and sneer all you want, but these are some of the most friendly fans, the most professional pros, and the most devastatingly organized convention I've been to. 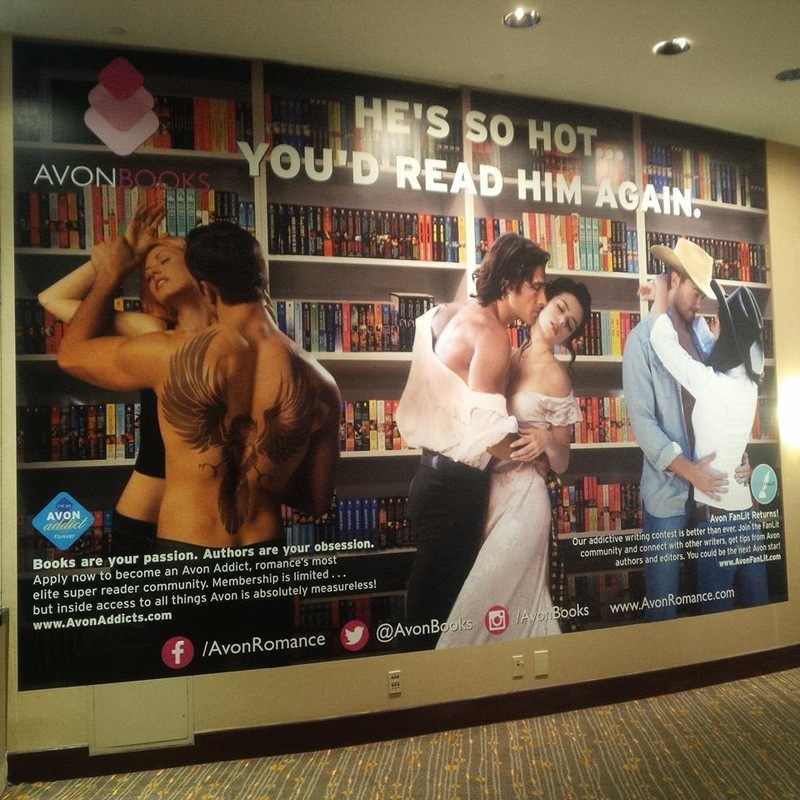 Forget all the comic-movie-actor-media-celebrity stuff we're used to seeing at our high-dollar cons: this place had lines out the door and down the hallway- for BOOKS! People were patiently waiting for hours - for AUTHORS! Everyone was nicely dressed and pleasant-smelling - because they took SHOWERS! Ugh, and *I* should have showered half an hour ago. Hurry with me to the end! Two cons. Two time zones. One weekend. Yes! I will be at BayCon in sunny San Jose this Friday and Saturday, and then jetting to Houston for Comicpalooza on Sunday and Monday. It will be EPIC. "Tex, you mad fool!" I hear you say. "You'll never make it!" Maybe not, hypothetical companion-friend, but I have to try! And now I really do have to stop typing into this box and start packing my Stetson. Find me this weekend, and if I don't make it back, tell my cat that I love her! P.S. : Ally, if you're reading this, this totally does not count towards my New-and-Improved Blogging Lifestyle. Love me. Forgive me. Call me. Don't they look lovely, June? Fabulous, Harry - I love the feathers. Romance readers SHOWER? What do we gotta do to get annexed by them and benefit from their superior civilization? I'm saying, dude. We need to work out a franchise agreement, like, YESTERDAY.